So last year I was at a community yard sale in the parking lot of the local supermarket. As I walked along on that warm Spring day, I encountered a first for me...a life size wood carved leprechaun! He should look familiar if you are a football fan. 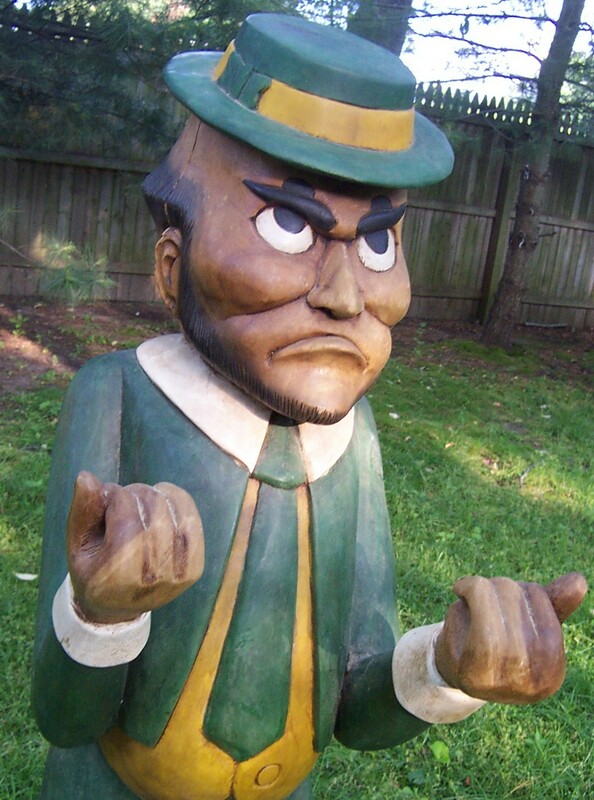 He is the official mascot of Notre Dame University, "The Fighting Irish Leprechaun". But I just called him Lucky! This guy was huge, over five feet tall and all hand carved. The owner of the supermarket had him positioned by the deli counter inside his store. After the supermarket received a face lift, old Lucky was put up for sale at the annual yard sale. When I got Lucky into the house my young son nearly freaked, "What the heck is that?" he shrieked. I explained he was basically like the old Wooden Indians that sat out in front of Cigar stores. He looked at him as if a weird stranger had just entered our house. I can't blame the little guy for being apprehensive about Lucky, he had a constant scowl on his face and looked pretty mean. Once Lucky was in the house he went no further then the family room off my garage. I didn't want to tempt a bad back moving him any further. So Lucky stayed in the family room for weeks keeping an eye over my son as he watched Sponge Bob. He got to be a regular member of the family with his constant looming presence. Needless to say my wife was not thrilled. Her daily question to me was, "When are you going to sell that thing?" She was not bonding with old Lucky! I decided the big guy was best sold on Ebay over Craigslist. I wanted as many people to see him as possible, especially Notre Dame fans. I originally started him with a "Buy it Now" price of $300. Due to his size there would be no shipping, it was pick-up only. I was pretty confident that a Fighting Irish football fan or just a good Irishman would really want this fella as a conversation piece. It took about a month but I finally found a buyer for Lucky. Two hard-core Norte Dame fans who co-owned a vacation Condo near the University. The guys told me they headed up to Notre Dame on football weekends to root for the Irish. Lucky was going to their condo and would be there to welcome these super fans every weekend! They paid me $225 for Lucky. A good deal for the buyers and a two hundred dollar profit for me. Could I have sold him for more? Probably, but because he was so unique it would have taken time to find the right buyer willing to pay a higher price. With an offer of $225, I decided it was time for Lucky to move out of my house. So sonny boy and I transported the big guy to a meeting point near the turnpike exit. (I charged them an extra $20 for partially transporting Lucky) When the buyers drove up you never saw two happier guys. They gently slid Lucky into their SUV like he was a new born baby. I was glad I found Lucky a good home ! As we headed back, my son admitted to me that he was going to miss good old Lucky. I took the moment to teach him a little lesson about Dad's hobby. I began, " You see son, our house is sort of like animal shelter...but for stuff. Dad brings stuff home to stay with us for a short while. We get to enjoy the stuff, play with it and admire it. But at some point the stuff has to move on to their rightful owner." He looked at me skeptically, not sure if I was pulling his leg or being serious. (A little of both actually) I tried to end on an upbeat note,"But don't worry, even though Lucky is gone, you never know what new cool stuff Dad will bring home for you to enjoy!" It's nice when I can combine Ebay flipping with good parenting. Great find, great post! Love the touching father-son lesson at the end. Thanks, we're sort of a cross between "Leave it to Beaver" and "American Pickers"! A rare Sunday yard sale.